Jazz dance originated in Africa and was brought to the United States during the time of slavery. African dance was very different than the the social dancing in Europe of the time, which was characterized by a stiff upper body. Africans adopted a looser, more fluid style of dance. 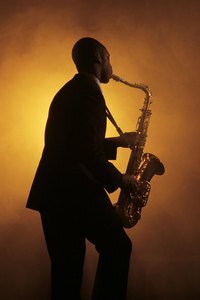 Rooted in this history, dance evolved into several distinct jazz styles. The cakewalk style of jazz dance was a socially acceptable way slaves made fun of their owners. Dances were usually held at the master's house on the plantation and often took the form of a competition with cake as the reward for the winning dancers, hence the name of the style. Slaves would line up and high step in a straight line, mimicking their masters and other aristocrats. The style died out between 1915 and 1920. The black bottom style of the early 1900s earned its name from the slapping of the bottom during the dance. Soloists or couples hopped forward and backward, stamped their feet and gyrated their pelvises, all while slapping their own bottoms. The Charleston first became a popular jazz dance style in the 1920s and is still being practiced today. The basic step of the Charleston involves pivoting the feet in and out while straightening and bending the knees. Weight is shifted from foot to foot and the unweighted foot kicks out at an oblique angle. The Lindy hop, characterized by breakaways from a couple's embrace to engage in intricate solo footwork, is often called the jitterbug today. The style originated in the Savoy ballroom in Harlem in the late 1920s. According to The Lindy Circle website, the name jitterbug may have referred to the way white people danced the Lindy hop, which appeared to some as though they were intoxicated. Today, the jitterbug name is used for a variety of different styles in different places. Swing dance and the Lindy hop were terms used interchangeably for the same dance style up until 1945, when other forms of swing dancing were invented, making the Lindy hop just one of many styles of swing dance. The boogie-woogie is a swing style where dancers move to a blend of big-band swing and blues music beats. The boogie-woogie is generally a fast style involving flying feet, hops, stomps and jumps.